Ranma 1/2 Set 5 Special Edition Review. Should You Buy? 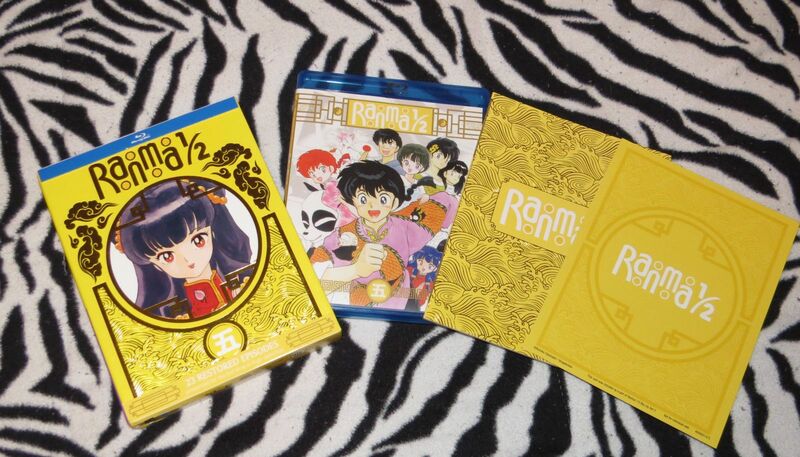 On March 3rd, Viz media released Ranma 1/2 Set 5 Special Edition on Blu-ray. The special edition contains an art card and a 32 page booklet with summaries for the 32 episodes in this set which are episodes 93-115 on three Blu-rays. It’s all packaged in a really sturdy feeling box that has room for the booklet, art card, and Blu-ray case. Ranma 1/2 is a classic anime that is deserving of a release that is crisp without crackling or awkward black bars that were present in previous releases. No longer do you have to worry about the VHS eating up your precious three episodes that you had paid twenty dollars for. Here you have a nice Blu-ray set of twenty-two episodes that should work for many years to come. But is it worth the $54.95 price tag? Continue reading to find out! As mentioned briefly above, this set is nicely packaged and before removing the cellophane it already feels like a good quality release. The artwork on the box is a mixture of matte and foil mediums, making the box very nice to display on your shelf. This box won’t get bent or crinkly easily like other cheaper, thinner slip cases used on other sets. Upon ripping open the shrink wrap, you really are treated to a worthwhile set. 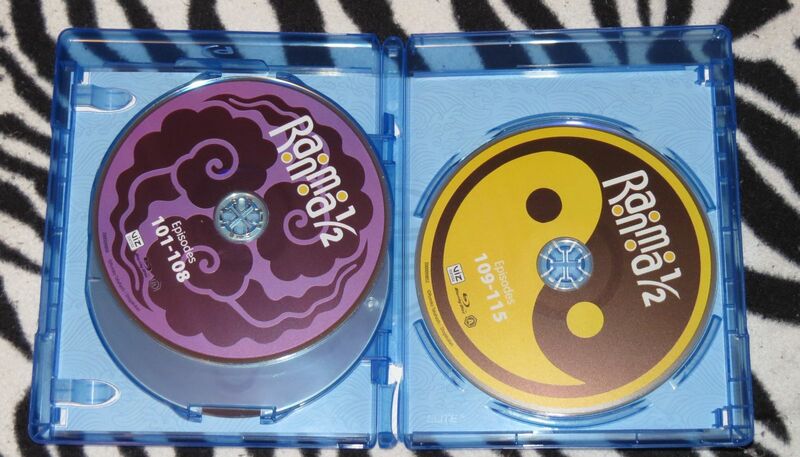 Even the discs are nicely designed – each one has a unique look that perfectly suits the show. Many fans of Ranma 1/2 know that the earlier releases were just plain ugly to watch during some scenes. Viz has done a great job cleaning up most of the popcorn. Overall, the animation is crisp and the lines are precise. Light colors such as tan, white, and green are nice on the eyes and appear consistent. Lighter shades of dark colors such as lighter shades of grey, brown, and black have some distortion and snow but if you sit far away from the television it is hardly noticeable. This fact does make me think; however, that a Blu-ray release is a little pointless. I understand that Blu-ray ‘won’ the format war and is more common in households now than before, but Blu-ray is always more expensive and why pay more if the show wasn’t intended for HD? The sound quality isn’t the greatest but the episodes have consistent volumes and you don’t have to struggle to hear the background audio or the voices. The sound is low and you will need to turn your up TV volume if you’re sitting far away or have hearing problems. On that topic – if you are hard of hearing, this set does not provide an “English dub/sub” option contrary to having that option in the settings menu. There are instances throughout the set in which the English does not match the subtitle. For instance, in one episode we hear, “Hey, check it out!” while the subtitles read, “What’s wrong principal?” The subtitles are best used with the Japanese audio. In addition to this, the audio for the show and the audio for the credits are not at the same volume. So if you’re turning up the volume to hear the voices and background music you’ll want to turn it down at the end of each episode so you don’t go deaf from the very loud ending credits music. This is pretty annoying but can be overlooked in exchange for a good quality image to look at. This set is not without quirks. There are portions of the episodes that will be frustrating for those who can’t read Japanese. Between some scenes Japanese text appears on the screen without translation. It’s probably stuff like “meanwhile at the starting line…” or something similar but it would be nice to know for certain. A subtitle would have been nice and I did check to see if a subtitle for these scenes appeared with subs turned on. No such luck. I’ll just fantasize about what the phrases are until I decide to ask someone. Getting past the issues with sound quality (which is pretty common with older shows, anyway) is easy when you remember that the older sets contained less episodes per purchase and didn’t attempt to clean up the images and audio like Viz. The set is packaged nicely and the episodes do look good. You can’t expect high-definition and mind blasting sound with a series that is clearly showing age. The Blu-ray version of this set prices each episode at about $2.50 which is not bad in a world where YouTube and Amazon Prime charge up to $10 an episode. Here, you get to keep your episodes and they’re physically yours in a nice box set with a booklet. You can always purchase this for less than $54.95 since Amazon charges $39.95. I almost wonder if Viz charges so much initially because of the expectation of retails and etailers discounting the set by several dollars. If you’re really looking to save a few bucks, you can skip the box set altogether and just get the DVD for $44.95 or $29.99 on Amazon. Based upon the quality, I don’t think anyone needs the Blu-ray edition. You’re really purchasing it for the nice box, booklet, and art card. I can’t imagine the quality contrasting too much between the two versions. I would definitely add this to my collection but I would have a hard time convincing myself to get the Blu-ray edition if it didn’t come with a booklet and box.